Keep the blue side up? JLG flying the Super Decathlon, March 30, 2012. Photo courtesy of Will McNamara. Yesterday I flew upside down for the first time! to understand and recognize conditions that could lead to an unintentional spin. The latter is the most important. For example, one such condition could happen during an approach to landing if you bank too steeply (and stall) while applying opposite rudder. It’s bad enough to stall during landing — for example, by pulling back too far on the control wheel — because you will rapidly sink and possibly crash. But if you spin during landing (a spin is the same as a stall, except you also start to spiral downward) then you will certainly crash. Hence the training. “Would you like to try a loop?” asked the instructor. Well, yes. After checking for nearby airplanes, you loop by pitching down and building up speed to 160 MPH, then pulling back on the stick until you discover that you’re upside down. Take a moment to appreciate the view. Then keep pulling back on the stick until you’re upside up again. Wow! Fly a different airplane. 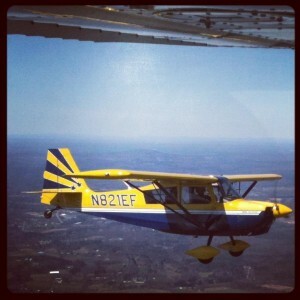 My first 12.6 hours of instruction have been in the Cessna Skyhawk. It’s an interesting airplane and you learn things like “check all four edges of your door to make absolutely sure it’s closed, instead of just verifying that the door latch is in the ‘locked’ position, or after takeoff you may discover that the door isn’t closed after all.” The 1.4 hours of spin training were in the American Champion 8KCAB Super Decathlon. The two planes have significantly different handling characteristics both on the ground and in the air; for example, we experienced a strong crosswind while taxiing and I had to push the right pedal basically to the floor to keep the plane taxiing straight; much more so than I would have needed to in the Skyhawk. Also the Decathlon uses a surprisingly-responsive joystick-type control stick whereas the Skyhawk uses a control wheel. 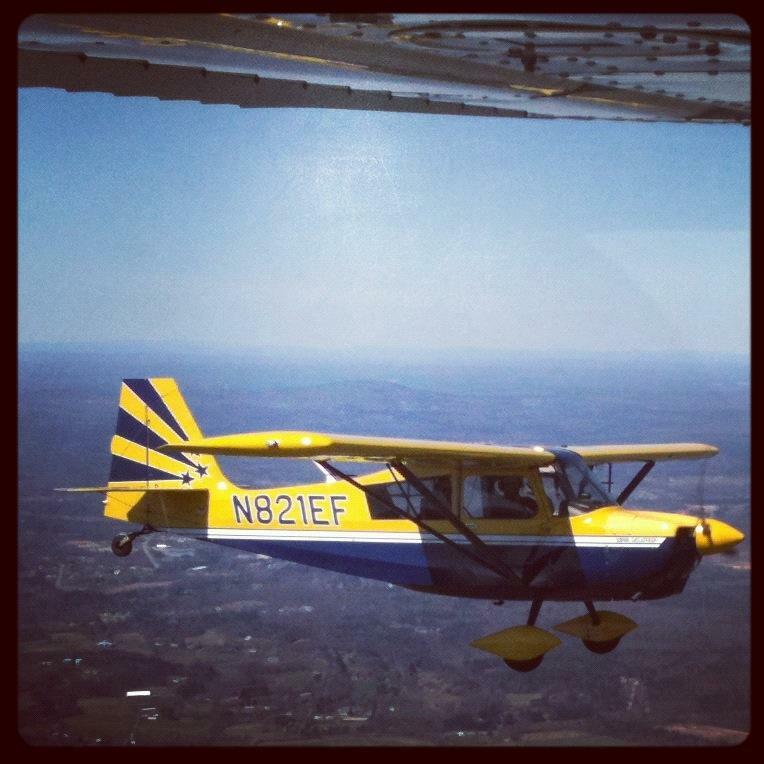 I enjoyed the chance to fly something new. Formation flight and wake turbulence training. We arranged with another pilot to fly briefly in formation, with our airplane just behind the left wing of the lead plane, so I could experience wake turbulence firsthand. The experience was fascinating — for one, it was mind-boggling to look out the window at 4,000 feet and see another full-sized airplane right there; usually planes in flight are tiny little things off in the distance. But the wake turbulence itself was also fascinating; one moment you’d be right behind the lead plane, and the next you were smoothly but insistently kicked 50 feet to one side. During ground school you learn techniques for avoiding the wake of large jets and other planes. For example, stay above the glidepath (and therefore above the wake) of a large plane in front of you, and land farther down the runway than that plane, because the wake naturally sinks after it’s formed and it disappears once the wing no longer produces lift. Keep your eyes outside the cockpit! In the Skyhawk there is an array of cockpit instruments that you can fixate on instead of using outside visual references to make decisions. For example, when flying the traffic pattern I often glance down at the attitude indicator (how much bank do I have in this turn?) and directional gyro (am I lined up 90 degrees from the runway heading bug after turning left base?) Even while taxiing I often glance at the GPS to determine whether my taxi speed is too fast. In the Decathlon these instruments aren’t available, so you’re forced to do what you’re supposed to be doing already — for example, figure out your bank by looking at the angle between the horizon and the airplane’s nose. I am curious to see whether I’m better at controlling the Skyhawk during my next lesson thanks to the forced ‘purity’ of flying the Decathlon. G forces add up. I was surprised to find that, for all my bravado while walking out to the airplane, I did have a limit to how much aerobatics I could take. After we did a bunch of spins, loops, and rolls, with me squeezing my stomach muscles as instructed to keep from greying out, I suddenly felt a warm flush throughout my upper body — OK, time to stop. (I am pleased to report that I didn’t need to make use of the complimentary plastic airsickness bag the instructor handed me at the beginning of the lesson.) Another aspect of comfort was the surprisingly uncomfortable parachute that we were required to wear by federal regulation — all occupants must wear a parachute in order for the pilot to exceed 60 degrees of bank relative to the horizon, or exceed 30 degrees of nose-up or nose-down attitude relative to the horizon. I generally apply far too little rudder when turning, resulting in uncoordinated flight. To turn correctly you both rotate the control wheel (deflecting the ailerons) and simultaneously press one of the pedals (deflecting the rudder). Pilots are expected to develop a ‘feel’ for the airplane — for example, subconsciously noting a slightly unbalanced feeling when not using enough rudder — so I’m concentrating on developing this ‘feel’. During landing I often find myself flying too high and too fast as I approach the runway. This symptom actually indicates two problems: First, I often don’t reduce power enough, or early enough, in the descent. Second, I often don’t trim the airplane quickly enough after making a pitch adjustment, resulting in the speed starting to creep up again as I unintentionally relax back pressure on the control wheel. Practice, practice. During crosswind landings I have had trouble keeping the airplane aligned precisely on the runway centerline. Often I will apply too much rudder or aileron input, resulting in the airplane making large movements instead of the small corrections needed to stay aligned. I landed very well during yesterday’s flight, so I’m hoping to perform as well in my upcoming lessons. Overall I’m having a ton of fun. My pre-solo checkride is scheduled for May 2, so my first solo flight will likely be in just over a month! Comments Off on Keep the blue side up?